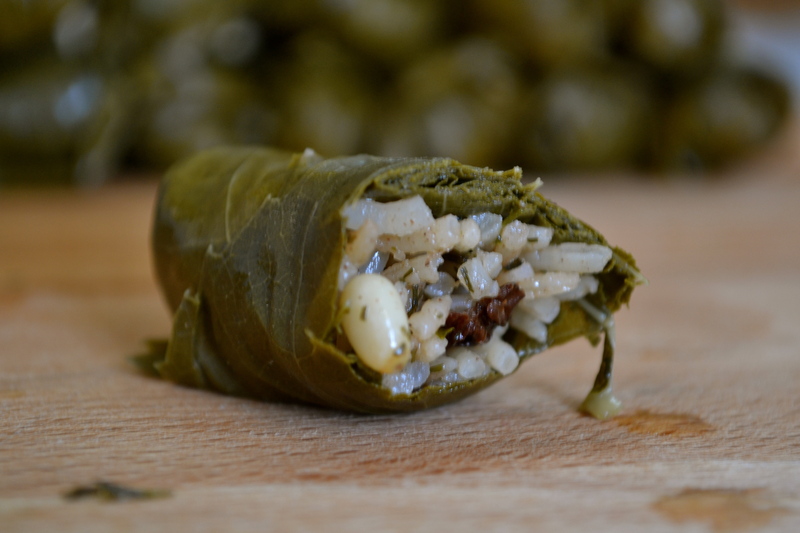 What’s better than a grape leaf stuffed with rice, sweet dried currants, and savory herbs and spices? 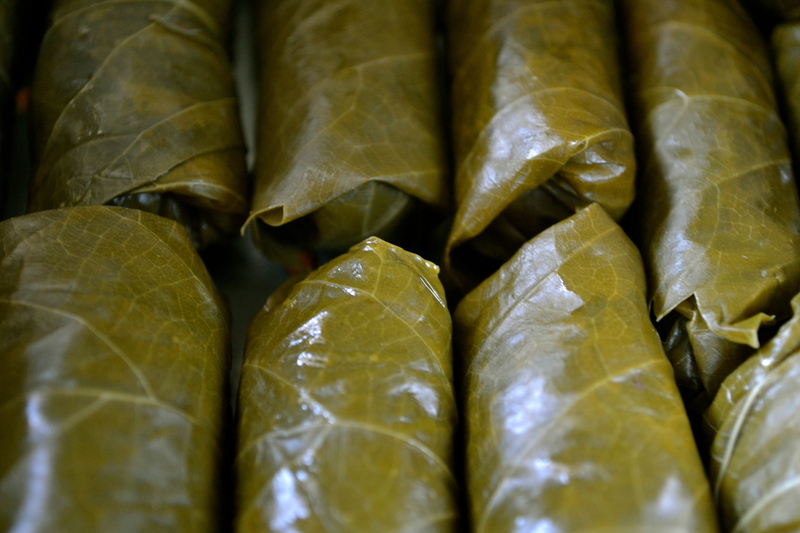 The combination of mint, dill, and cinnamon in these dolmas sets them apart from traditional Mediterranean or Middle Eastern grape leaves. Cinnamon was used medicinally by the Egyptians to relax muscles and stabilize blood pressure. Maybe that soothing association is why we have such an affinity for the smell of warm apple pie, and fresh out of the oven cinnamon buns. Combined with the dill, which ads a zestiness to the dolmas, the cinnamon isn’t warm in a nostalgic way, but rather, in an exotic sort of way. 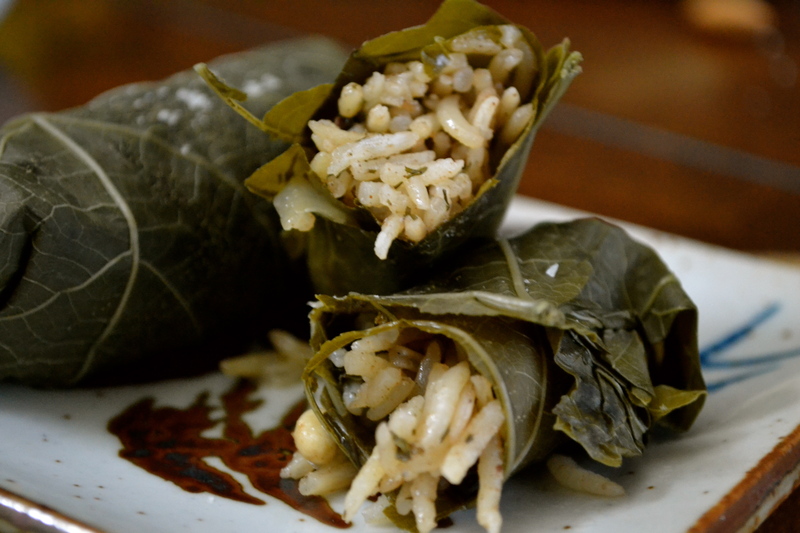 Mint rounds out the flavors with a freshness that makes these dolmas feel savory and healthy. Served with a dollop of creamy mint-yogurt sauce, these stuffed grape leaves are a great addition to a tapas meal or as an hors d’oeuvres before a larger meal. The cooking classes I led this week loved them, and can attest to how simple they are to mix up and assemble (once you get the hang of it). There’s something about this flavor combination that makes me think of Morocco. While I’ve never been to Morocco–or outside of the country at all, for that matter–I’ve had Moroccan food, which had some of the most savory and delightful flavors I’ve ever tasted. This association leads me to a not-totally-unrelated tangent. There was a little hole in the wall music venue in Salt Lake when I was a teenager called “The Moroccan,” which was a bit of a dive. It couldn’t have been more than 30 x 20 feet, with half of that space given to the band. There were never real lights, only bare, red or black bulbs hanging from the ceiling, which was good since it meant you couldn’t really see who or what you were standing next to. But for those of us too young to see bands play at the bar (unless you had a fake ID or after you’d had it taken away by a crotchety doorman at another dive) the Moroccan was great. Eventually the Moroccan either was closed or shut down, but I have some interesting memories from when it was around. Wow, from grape leaves to dive bars. How did we get there? Anyway, here’s the recipe. Eat it and feel like a teenager again. Makes about 30, and is modified from a recipe I found online, here. To make the rice mixture, pour the olive oil into a hot skillet, set over medium-high heat, and wait for it to heat up. When the oil is hot, add the onion and saute until it is just starting to soften, about 5 minutes. Then add the rice and pine nuts and cook until they are just starting to brown, stirring regularly, about another 5 minutes. Then add the water, green onions, currants, parsley, mint, dill, salt, cinnamon, and pepper. Stir to combine. Cover the pan with a lid, and let simmer for 15 – 18 minutes, until rice is cooked through. Remove from the heat and let cool enough to handle. Here’s where the fun begins–stuffing the dolmas. I usually have a helper do these if I can find one. Little kids come in handy, but often have to be bribed. Before you stuff the grape leaves you will want to rinse them in water to get the residual brine off of them. I usually place mine in a medium bowl of water and let them soak for five of so minutes beforehand, and then just pat them dry a little. 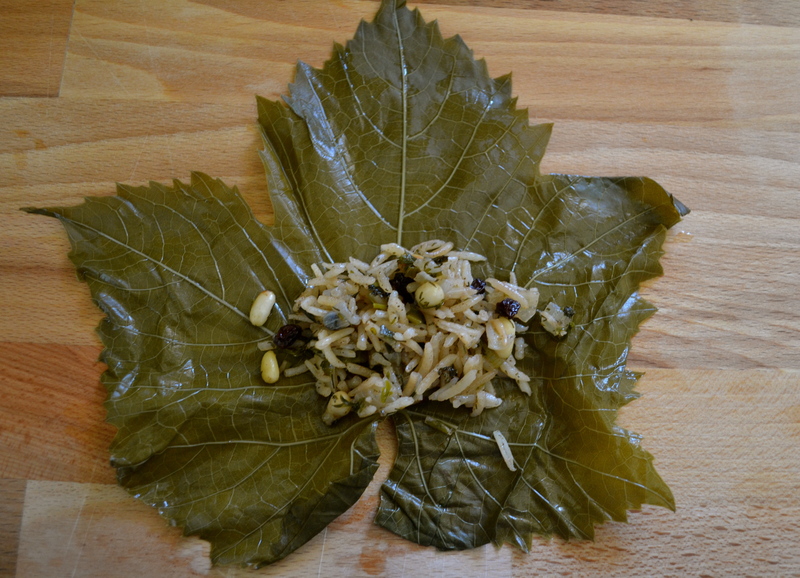 With a grape leaf in front of you, place about a tablespoon sized heap of rice in the center of the leaf. If your leaves are too small, or have a tear in them, you can put two leaves together to make them larger or to cover the defect. If you roll them up nice and tight, no one will be the wiser. Anyway, you want to roll these up kind of like a burrito–or like the blitzes I showed you a week or so ago. 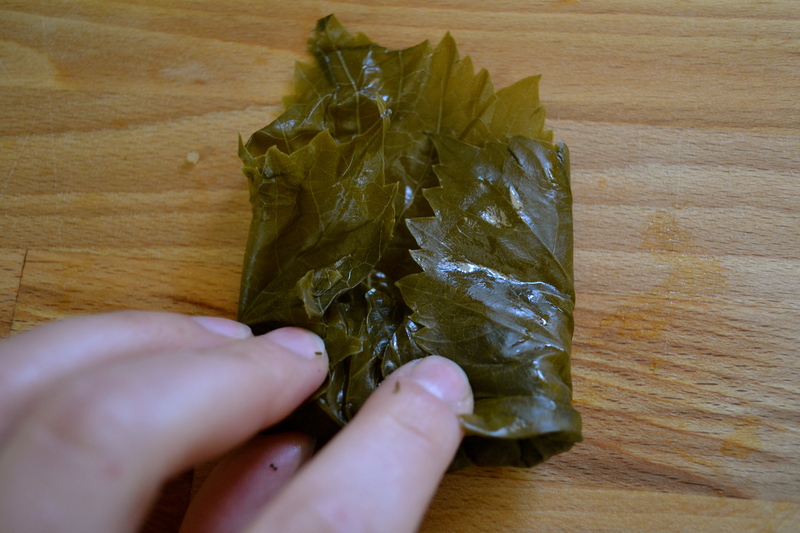 Start by folding the bottom of the leaf over the filling and then, with your fingers, tuck the mixture in so it is snug inside the leaf. 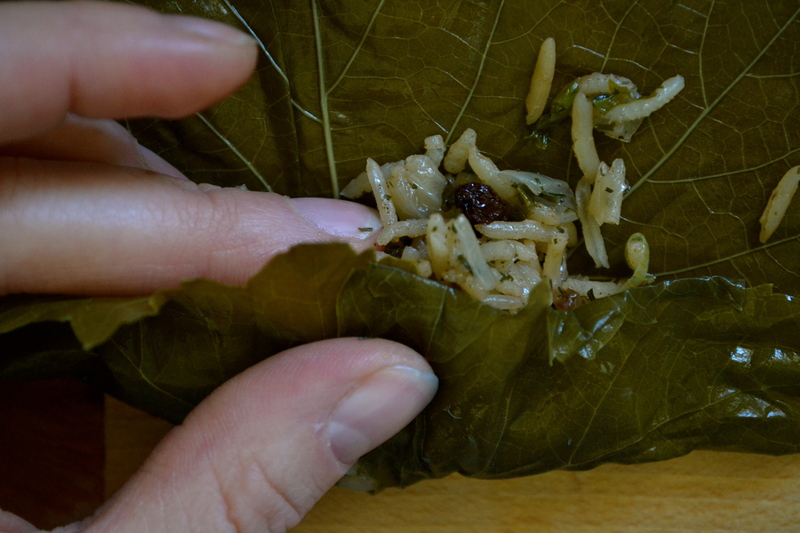 Fold the sides over the middle, and then roll the filled dolma to the end of the leaf as tightly as you can, taking care not to tear the leaf. If you do, simply wrap another leaf, or section of a leaf, over the torn part a few time. Once you have used up all the mixture, put the dolmas in a steamer basket, layering if you need to, and steam for about 10 minutes. The steaming makes the leaves more tender and helps everything stick together a little bit better. However, I have made these in a hurry and skipped the steaming process with no harm done. If you would like a dip to go with these, mix a tablespoon of minced fresh mint in a half cup of plain Greek yogurt. Serve at room temperature or even cold. These are great to make up a day in advance. You can steam them right before you serve them, or just let them sit out at room temperature for a while if you have already steamed them. For a complete tapas meal, serve with tortilla espanola, spanakopita, stuffed dates, and spiced almonds.